On a scorching day last summer, a team of students in the Julien J. Studley Graduate Program in International Affairs (GPIA) arrived at a once-abandoned textile factory on the outskirts of the city of Thessaloniki, Greece. Inside the building, hundreds of Syrian Kurdish refugees, recently relocated from a camp on Greece’s border with Macedonia, were living in tents. While the space was an improvement over their former camp, poor ventilation and high temperatures had combined to make it unbearably hot; disease was spreading because of limited access to health care; and basic necessities were in short supply. The visit to Thessaloniki was one of several stops on GPIA’s summer 2016 International Field Program (IFP). 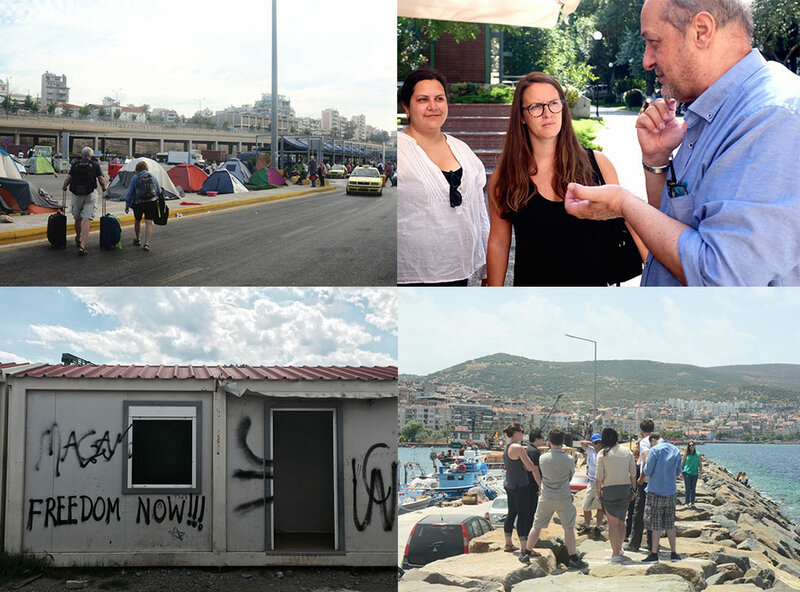 Over the course of two months, GPIA students traveled to six countries along the Balkan refugee route — Turkey, Greece, Bulgaria, Serbia, Kosovo, and Bosnia and Herzegovina — to investigate the mass movement of vulnerable people to Europe. The students had spent months researching and reading about the situation, but no amount of time in the classroom could prepare them for what they saw in the field: Conditions that defied their assumptions about the scale, nature, and complexity of one of modern history’s most urgent humanitarian crises. As scholars and researchers, students were challenged to design innovative policy solutions to this pressing social issue while considering their place in an increasingly globalized world. Using every form of transportation at their disposal, they hopscotched from Turkey, where they explored historical migration trends, to neighboring Greece, where they investigated the impact of migrant flows on urban environments. They then journeyed to Bulgaria, Serbia, Bosnia, and Kosovo, where they studied issues connected with the Yugoslav wars and the region’s post-conflict transformation. They spoke with a range of actors: government officials, members of international and national organizations, citizens, and refugees. Students had the goal of tracing the policy implications of a recent agreement between the European Union (EU) and Turkey regarding the status of refugees. Under the deal, the EU agreed to pay six billion euros to the Turkish government to take back refugees captured en route to Greece. The students explored the impact of this policy on refugees, physical infrastructure, and actors immersed in the crisis. In Thessaloniki, students saw those effects firsthand. Benazar Acosta observed that despite the agreement, refugees were still finding their way to Greece, often via a treacherous voyage across the Aegean Sea. Furthermore, by “marginalizing” refugees — forcing them back to Turkey and/or expelling them from urban areas — EU countries were actually making a bad investment, Benazar Acosta says. The refugee crisis also illuminated broader issues, particularly economic ones, affecting the European continent. According to Silina, one Greek official in Thessaloniki pointed out that while she attends to the refugee crisis, she must also focus on the needs of her constituents. The trip culminated in From Bodrum to Belgrade, a website of the students’ findings. It features text, video, and images presenting stories of refugees, student perspectives, and critical analyses. Benazar Acosta never could have arrived at the conclusions she did simply by reading a book or hearing a lecture. It is GPIA’s connection to the outside world — and to pressing issues such as Europe’s refugee crisis — that makes it truly unique.